Date into Rescue: 5/26/2017 Reason for being in rescue: found as stray Foster location: Dreamweaver Farms, Pacolet SC Special Needs? Huckabee has heartworms. He will be sent home with 12 months of heartworm preventative. This is called the slow kill method . Please check with your veterinarian before adopting a dog with heartworms. Weight: 24.3 lbs Height: est 20' at the shoulder Adoption Fee: $200 Fence needed? Yes What kind of home would be best for me? 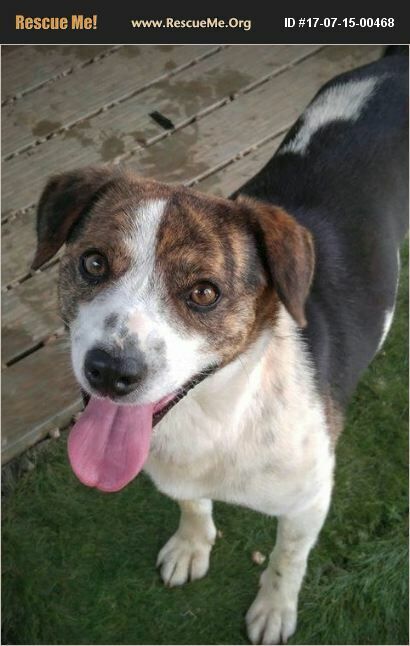 Huckabee is looking for a family with a lot of experience in taking care of dogs. A typical hound, Huckabee has a strong personality and a desire to shape a really nice basic personality into a wonderful dog. Huckabee is bright - and bright kids need loving structure or they will take advantage of you. What is my personality like? Huckabee is a sweet lovable boy but he's definitely a strong personality. For example, he walks on a leash, but he likes to lead. He is intent on going where he wants. He is also good at slipping between feet and through gates. That can be dangerous and he needs to be taught to respect boundaries. He has spent time playing with dogs much larger than he is and did well. He loves the freedom of a fenced in yard to run and play in. How do I act when I first meet new people? Friendly and inquisitive. More tips and tidbits: When introduced to a new group of dogs and a new area of our farm he had not been to in the past, he enjoyed the stimulation of a new environment, smelling new smells and marking his territory. So far, we've introduced Huckabee to a kitten who is not very active yet as she is too young . Our caregiver could not make a good call on whether he would be good with cats based on this one encounter. He wasn't aggressive, but at that point he was overwhelmed by seeing new dogs and new smells and a new place. He was busy taking it ALL in. He'll need to be cat tested again if a cat owning home is interested. The boy is a good guy. But he is young and very active. He can't focus on one on one time. His mind and body are going in many different directions. He's a cutie and he needs some work *as most young dogs do) but he has a great disposition and that you can't teach. House trained? Dogs can be house trained if they are in the right environment and are allowed to follow a schedule as long as a physical reason doesn't keep them from being trained. A dog house trained in my home may not be in yours. We will help you teach your new dog this necessary skill and based on your schedule. My age: Est birth date 5/26/2014 Please note - we do not ship dogs. If you are interested in adopting, please take a look at the distance between the foster home location and your location and make sure you are willing to make that trip. Most of our dogs are at our farm in Pacolet, South Carolina. To apply, please visit our webpage at www.carolinapoodlerescue.org and visit the tab on the left that directions you to the online application. Please note that when screening applications, we look at the entire home and then make suggestions based on what would be a good fit for your home. You are not being screened for a specific dog although we are looking to see what type of dog interests you - poodles or non poodles, color, age, etc. Others here may be a better fit for you. It is very difficult to get to know a living animal from a picture and a short description. Since we are constantly getting in new dogs, this may be a dog not in our listings yet. We want you to be very happy with your new companion and will make suggestions based on what you tell us about you. Thank you for considering CPR.